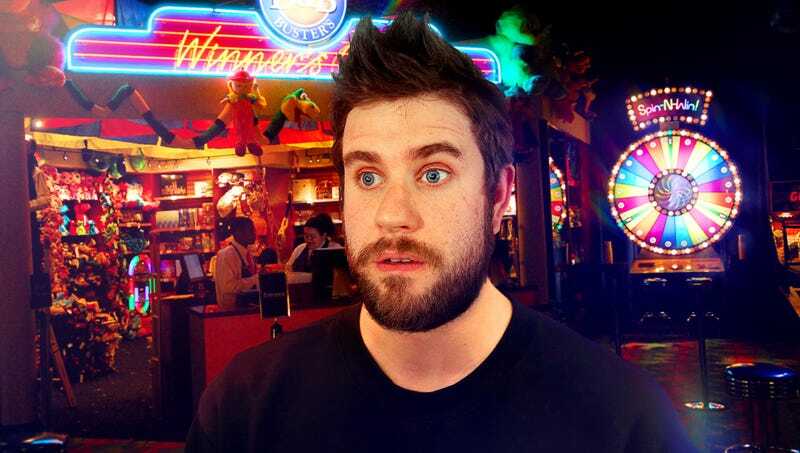 SOUTH BEND, IN—Stumbling through the restaurant and gaming establishment in a dazed and incoherent stupor, local man Rob Woodham, 31, reportedly slipped into a ghastly, blinding fog of insanity Thursday just before he was asked if this was his first time at a Dave & Buster’s location. “Can I get you a menu?” said a waiter, slowly transforming into a top-hat-wearing anthropomorphic polar bear in the maddened mind of Woodham, who—with his consciousness shattered by the swirling maelstrom of flashing lights and clanging bells amidst a chaotic realm where all logic had ceased to exist—could only drool and answer in crude grunts. “Sir? Excuse me, sir? Would you like to try our chicken wing special, or maybe I could just start you off with [the divine serpent, which you will cradle in your arms until true bliss flows freely through your veins, releasing you from the cruel facade of your mortal prison]?” At press time, sources reported that a profusely sweating Woodham had urinated everywhere and screamed out in hideous, esoteric tongues before tearing off his shirt and running outside.